1 - 24" Lamination line for engraving material - Gauge Range: .060" to .300"
2 - 36"-48" Lamination line for Marine, RV, and POP - Gauge Range: .060" to .300"
1 - 32" Lamination roll-line for thin gauge applications - Gauge Range: .017" to .060"
1 - 60" State-of-the-art lamination line, featuring dual lamination stations. 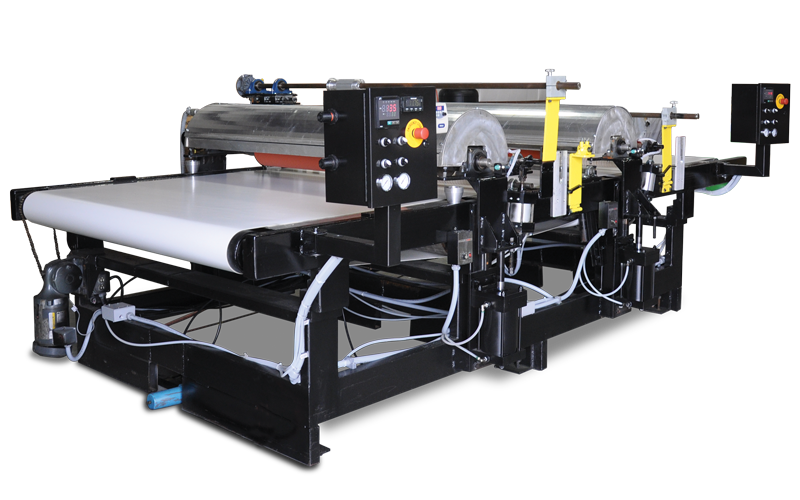 Gauge Range: .017" to .300"
Rowmark Custom Laminiations' 60" sheet-fed laminator is 120" long and 72" wide. It has the capacity to laminate sheets up to 60" in width. The line was custom built and tailors to a specialized segment of the market, increasing laminated sheet options for customers. A double head lamination line, the machine features dual lamination stations; one upstream and one downstream. This allows for the application of two foils on one run. It also includes a winding system for finished roll stock and dual roller/belt speed controls, as well as advanced digitall temperature displays and air pressure sensors for tight pressure control.